Found these online (one from eBay, one from Google searching) and they are really awesome gloves. 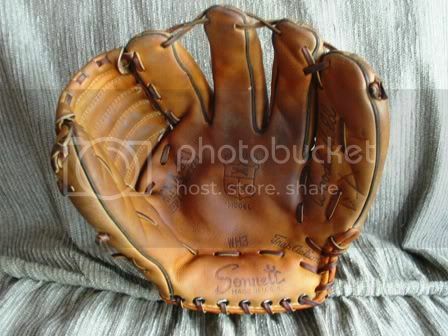 First one is a Sonnett model WH3 Woodie Held glove. I really like the Sonnett gloves and this one is a keeper. There is a neat stamp in the middle that says "Medallion Model." I also like the fact that Sonnett didn't forget that they started as "OK Mfg" and they say "Play OK" on the side of the thumb. The only issue is that the original owner carved his name on the side of the pinky finger under the endorsement stamping. Looks like his energy was spent after doing that because this glove didn't see much use. The second glove I got from eBay. 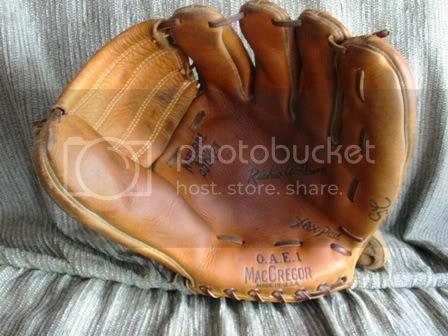 This is a Oregon Athletic Equipment Co. model OAE1 made by MacGregor with a Richie Ashburn Endorsement. Tag is really cool - mountains and clouds in blue stitching. 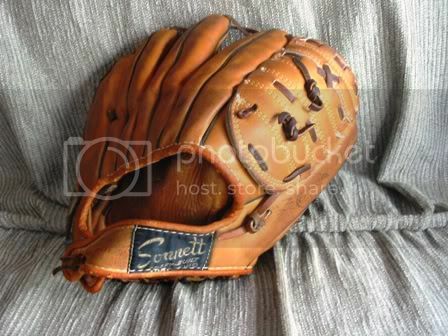 Leather on the glove is beautfiul - this glove hasn't been used much either. I have been looking at the Woodie Held on that site for almost a year now......$35 was a great buy. It was a pretty good deal - I'm happy. I asked the guy if he had any other gloves not listed yet and he's sending me two to take a look at. One is a MacGregor Jim Maloney personal model - looked really nice in the pictures. I had the Maloney store model glove at one time. Stiff as a board. MacGregor had lost part of its touch (or out of touch) at the time. Overlaced the glove palm side. Big glove as I recall. I received the Maloney glove yesterday. The one I got is very soft and the leather is in nice shape. I see what you mean about overlacing but it seems to be put together pretty well. 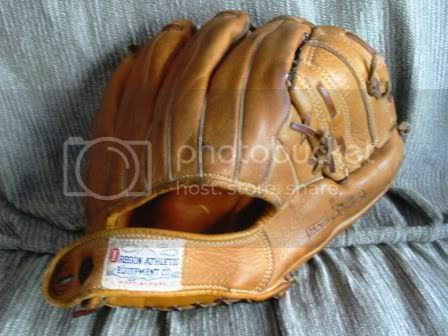 I don't know if it's a keeper for me but it is a great little glove. I'll post pictures when I fix my flash card reader on my computer - my warranty is still good so the company is coming to replace it this week hopefully.